Pr ovided by: Tango Signs. 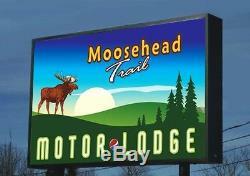 We offer custom lighted outdoor signs and channel letters nationwide. Our lighted, eye-catching exterior box signs come with a variety of options to meet your advertising needs. Exacting details throughout with durable aluminum construction, steel hardware, sturdy welded corners, high-impact acrylic face panels, and UL listed electrical components. 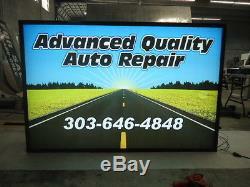 This listing is for one double-sided lighted outdoor sign 4 x 8. Signs are delivered complete and ready to install. This listing includes Implex sign faces by Plexiglas - a high-impact, UV resistant, material 8X STRONGER than standard acrylic sign faces! We offer flat, panned, and embossed face types. White is supplied as standard, but clear is available upon request. Panned and Embossed face panels require special quote. This listing does not include graphics. 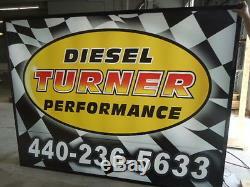 However, we provide both standard vinyl lettering and digitally printed graphics. We use 3M exterior grade, UV resistant vinyl. All graphics are printed at a photo quality resolution of 720dpi. Proofs will be sent for your approval prior to print and production. 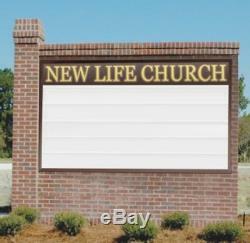 This listing includes preparing your sign with hardware for mounting between two existing poles. Heavy duty, weather-resistant, extruded aluminum casing. 090 or thicker, depending on sign size with welded corners, steel hardware and reinforcement. Capable of withstanding winds up to 140mph. Our standard cabinet depths are 7" for single-sided signs and 12" for double-sided signs. Sign face retainers are hinged for easy access to bulbs and installation points. We use quality Matthews® paint. Standard color options are: True Red, Sultan Blue, Dark Green, Black, White, Brown/Bronze, Yellow, or unfinished. You will be notified in advance if your address is in a surcharge area. Tango Signs does not install signs. However, we have an'Installation Assistance package. To help prevent errors, you will be provided a proof of your sign or letter. Design for approval prior to production, and our quality control staff will do their best to ensure each order is correct. What our clients say feedback from our sign customers. We have had our sign for approximately 5 years and are very happy with the advertising that it promotes. Your service has been exceptional. Keep up the good work! 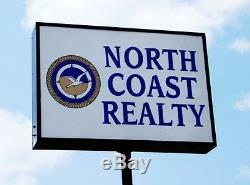 Jane Grondin, Owner/Agent, North Coast Realty, Michigan. Scott Millard, Main Street Service Center. I appreciate all your help and will gladly refer all of my friends and associates to you! - Steve Gore, Gospel Way Church. - Christian, Gotta Have It! Professional work - I'm very happy! Will do business with you again! - Clifton Pitts, Allegan MI. Thanks alot - our sign looks GREAT! Bill Allen, Allen Lawn Care. The item "NEW Double-Sided 4x8 LIGHTED outdoor CUSTOM business pole SIGN roadside retail" is in sale since Tuesday, February 5, 2013. 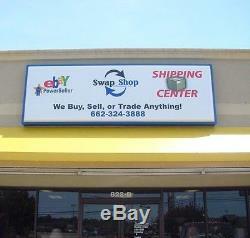 This item is in the category "Business & Industrial\Retail & Services\Business Signs". 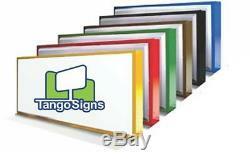 The seller is "tangosignco" and is located in Sign Headquarters, SC. This item can be shipped to United States. Brand: Custom Made to Your Specifications!